Bali Asli visitors and guests come from literally all over the world and not least of all from the Netherlands. This article just shows how international Bali Asli is and was spotted in a Dutch newspaper by a friend of Bali Asli. 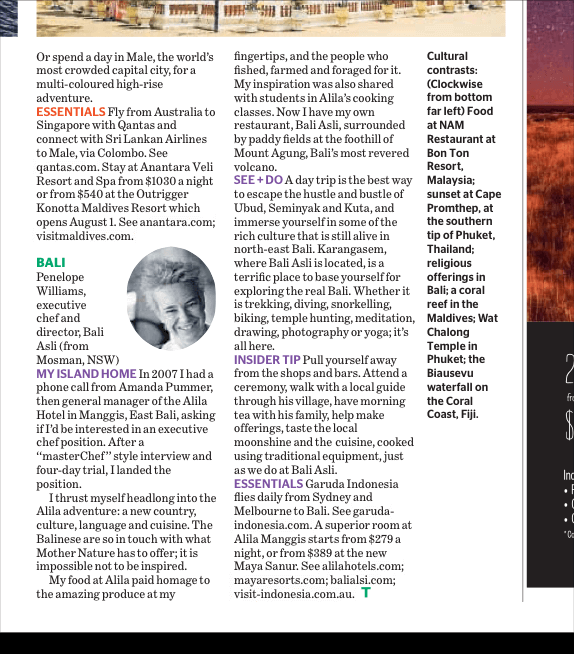 It says, “Bali Asli is a wonderful restaurant and the host, Penelope Williams, is very friendly”. 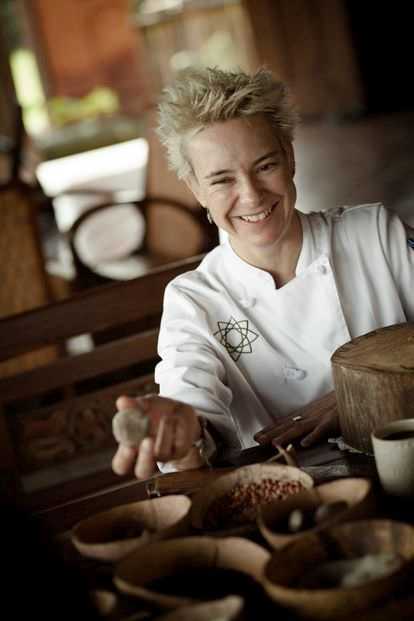 On TripAdvisor you can read hundreds of rave reviews about Bali Asli and their cheerful executive chef Penelope Williams. Among the few critics is an expat who has lived in Bali for several years. She describes the restaurant as a place for naive tourists and her advice is to get far less expensive but good Balinese food at a local warung. There’s no accounting for taste and it’s certainly not cheap, so why would you go to Bali Asli? Let’s find out! The mighty Mount Agung towers over Bali Asli and the view is simply stunning. about Balinese cooking but also about the local way of life that makes Bali so special. Plus the view from the restaurant is simply stunning! Authentic Balinese Cuisine and Unique Culinary Experiences. For the full story, visit their website. 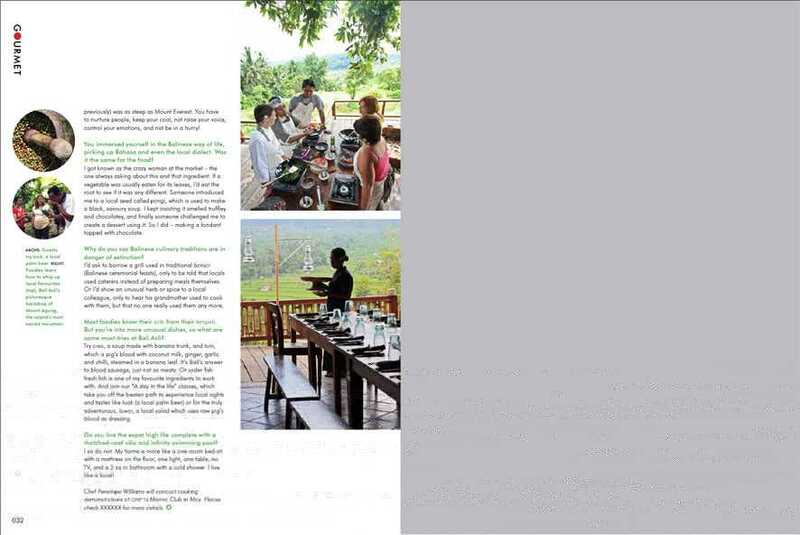 Bali Asli featured as one of the best restaurants in Bali. From the culinary treats of Ubud to the high class resorts of Jimbaran Bay, Bali is a foodie haven which can surprise even veteran travellers. The island’s thriving restaurant scene embodies the best elements of Balinese culture; Indonesian traditions, Western and Australian influences and an endless party atmosphere, whilst using the fruits of this tropical paradise to create unique culinary creations. Visit The Culture Trip website for full story. conserving the Balinese culinary tradition. Text: Stephanie Mee. A day-trip must for foodies and those intrigued by Balinese culture. Hire a driver and aim for Candidasa then head inland. Asli means ‘authentic’ in Balinese and this is the place to experience fine local cuisine with a locavore pedigree, including the drinks list, a highlight of which was the pineapple beer. Even the cooking methods are traditional. The menu is written daily on a lontar, a palm leaf manuscript and features items you’re unlikely to find elsewhere. 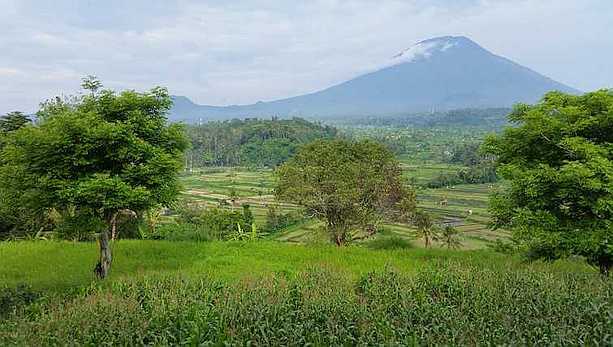 Set up high with views for miles and with luck Mount Agung will rise clearly in the distance. NOTE: Open for morning tea, lunch and afternoon tea. Take a detour before or after to see the fabulous Tirta Gangga, water palace built in 1946. From beach clubs and aphrodisiac cocktails to sophisticated high tea, the ‘island of the Gods’ has plenty to offer travellers. Here are Bali’s top 10 secrets, as revealed in Bali Secrets from Deck of Secrets. 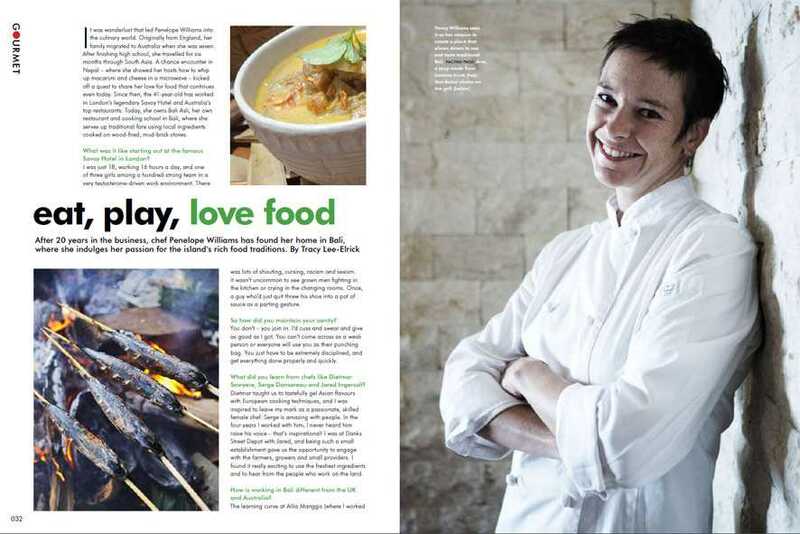 The highlight for many of us was the day we spent at Bali Asli with Australian chef Penny Williams, a former head chef at Alila Manggis. 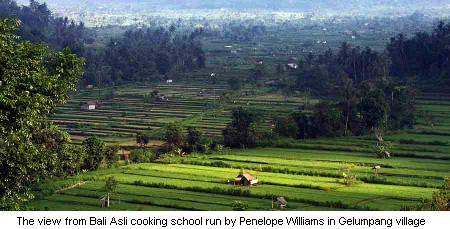 She now runs a small restaurant and cooking school with more amazing views of Mount Agung. Her classes are themed “A day in the life of…”. We did “A Balinese woman”, going with Penny to Amlapura market to help her buy supplies, and returning to make the daily temple offerings of flowers. Then we all made a selection of dishes that we ate for lunch, learning a lot about the history, culture and food of the island along the way. I highly recommend it and wish we could have gone back for another meal! The few days we stayed at Villa Gils felt longer, as everything flowed so well. Extensive emails with lists of ideas for activities were communicated before we left Singapore, and after a short chat to Wayan each morning, our days were filled with a balanced mix of day trips and a quiet dinner in the villa, or relaxing by the pool and more formal dinners out. I did feel quite envious of the Australian couple who lived permanently next door. We could see them each morning on their balcony, having breakfast to the sound of crashing waves while men shimmied up the trees to cut down branches and coconuts. There is so much more to explore there. A bumbu is on the stove; a pivotal ingredient in Balinese cuisine, the paste of chillies, garlic, shallots, candlenut, nutmeg, ginger, tumeric, palm sugar, shrimp paste and lemon grass bubbles away. 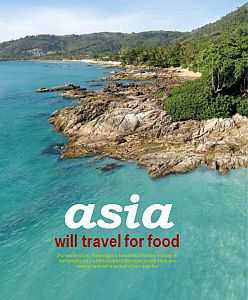 But you won’t find bumbu being used in most of the tourist restaurants around the island, warns our teacher, swiss chef Heinz von Holzen, who brushes off our guesses at what Bali’s indigenous dishes might be. Forget gado gado – mixed vegetables with peanut sauce, originally a Javanese dish. Nasi goreng and mie goreng – fried rice and fried noodles – are a Chinese import. And some form of satay, meat on a stick, is pretty much found in every major global cuisine. Though as with many cuisines it’s about getting four flavours in the right balance – sweet, salty, sour and hot – Bali’s cuisine is different and if you don’t know what you’re looking for, how are you going to find it? 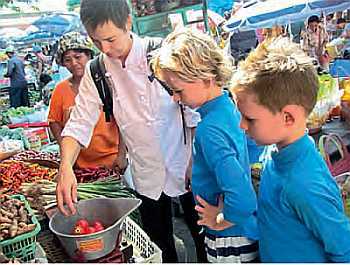 A cooking class is a good first foray into the world of fresh spices that Balinese food blooms from.